Grammy award nominees Northern Cree will kick off ceremony in L.A. When the Native American music album category was eliminated from the Grammys in 2011, Steve Wood thought Northern Cree's run of nominations had likely reached its end. The group's co-founder is delighted he was proven wrong. "We thought it might be a little tougher to get back, but we got nominated, which is pretty darn cool," Wood said excitedly. 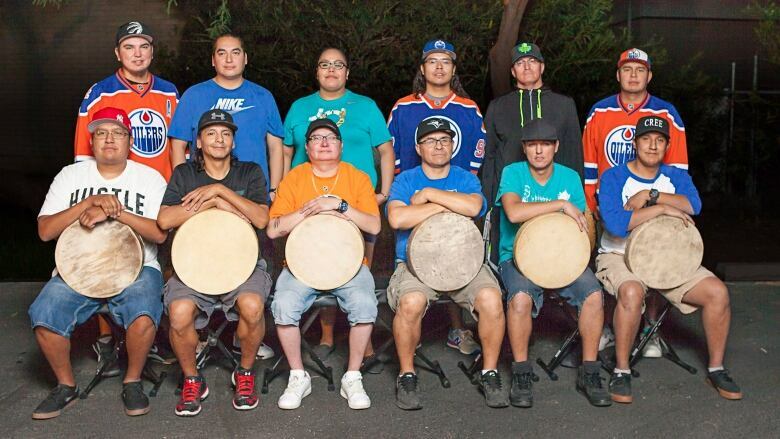 The award-winning Alberta-based Indigenous singing group has received its seventh Grammy nod. Northern Cree will compete in the best regional roots music album category for It's a Cree Thing. What's more, Northern Cree will be kicking off the pre-telecast festivities in Los Angeles with a performance during the afternoon ceremony on Feb. 12, where awards will be handed out in approximately 70 categories. Wood said while they still don't know which song they'll perform, it's important to the group to authentically represent both themselves and their heritage when they take to the stage. "I want to make sure the audience knows that we still exist and we still have our language and we still have our song and dance. We're still very much here," he said. "We're probably going to open up with a number in our traditional language. The music will be there, but all of the lyrics will be in Cree, because I just think if we open up with a number with English lyrics, that's not really us." Wood and his brothers Randy and Earl co-founded Northern Cree in 1982. While the group originates from the Saddle Lake Cree Nation in northern Alberta, it includes members of other First Nations in the Treaty 6 area, including the Frog Lake Cree Nation, Onion Lake Cree Nation, Samson Cree Nation, Louis Bull Cree Nation and the Poundmaker Cree Nation. Members include Wood's son, Joel, as well as Shane Dion, Leroy Whitstone, Ferlin McGilvery, Penny McGilvery, Jonas Tootoosis, Marlon Deschamps, Conan Yellowbird, Dezi Chocan, Ben Cardinal, Kyle Pasquayak, JohnBoy Moosomin, Randall Paskemin and Mickso Deschamps. The group, which has released 37 albums over 35 years, has created music for and was featured in the 1999 biopic Grey Owl directed by the late Sir Richard Attenborough. Several years ago Northern Cree opened for the Tragically Hip during a Canada Day concert at London's Trafalgar Square. "It's all about how you presented it to the audience, and now we've done that. Now our music is recognized at the most prestigious music level in the world." Wood said their latest album was dubbed It's a Cree Thing as a nod to the particular type of singing of round dance music that is indigenous to Cree people. "Over the winter months, those ceremonies, those festivities are happening every weekend across the plain," said Wood. "They're for all ages, from the youngest person to the oldest, and it's a whole night of song and dance and feasting and laughter." The group members balance their singing careers with day jobs. Wood is a Cree language instructor to First Nations students, one of several school teachers in the group. Wood is excited at the prospect of paving the way for other up-and-coming Indigenous artists and other youngsters who may one day take to the Grammy stage. "I've always thought that we were just a vehicle for opening up the doors for the next generation," said Wood. "[For] young First Nations people, my dream is that they believe in themselves and that they don't have to be anybody else. They can aspire to great things ... and not just young First Nations youth, but youth in general."